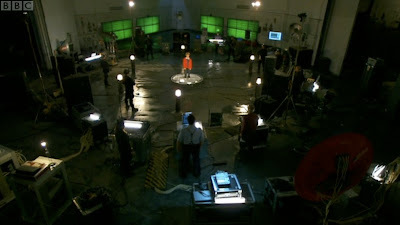 The idea of sacrifice has been one of the strongest themes in both the new version of Doctor Who and Torchwood and the closing episode of Children Of Earth was perhaps the ultimate statement in this 'slaughter of the innocents' dramatic trope, the series own use of the 'death of one to save all' motif. What Day Five clearly demonstrates is the unflinching courage of writers Russell T Davies, John Fay and James Moran to travel into the abyss and conduct a reportage from the front line. I didn't think we were going to get a satisfying ending and I honestly thought that the idea of using a reset might just have made it into the episode as a way of writing themselves out of the various corners they'd arrived in. But they reveled in those dark corners and went further, pulling no punches as they went. It was striking to open with Gwen narrating the end of the world in similar fashion to Rose's eulogy in Doomsday and it suggested that this was indeed the end of Torchwood itself and that all was actually lost even before the episode unfolded. 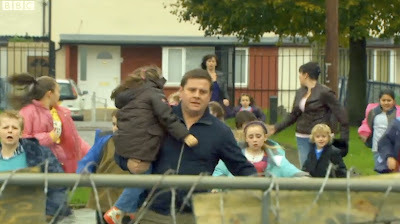 The structure of the episode cycled back to this reportage and opened it out to feature Rhys filming Gwen in the barn with the children they had rescued from Rhiannon's house. This was not the end, merely a prelude to it. And the children, who were always the focus of the story and had been the beginning of the narrative through their possession by the 456 were also, very fittingly, and in the nature of this circular narrative, their end. But what an end. 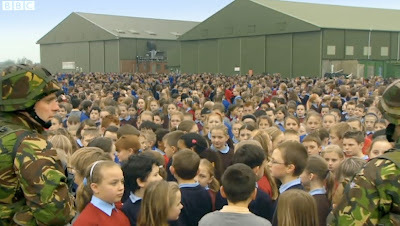 As the government, hostage to American General Pierce, carried out their cull of 10% of the child population, those that indeed served its modus operandi in the end realised that they were propping up something so ugly and heinous they understood that only by switching sides could they affect the outcome of the 456 demands. Johnson (we never find out her first name) who has been the cartoon villain in the midst of the narrative finally reveals herself to us and to Alice, Jack's daughter. She's as real as all the other characters and just hides behind her duty. She finally becomes a lynchpin in the desperate solution that removes the 456 from the Earth. The interesting aspect of Day Five is how it does pick the stories of Johnson, Alice and Clem and makes them integral to the conclusion of the story. Thinking their narratives had drawn to a close in Day Four, it's a surprise and a relief to see how they affect the outcome of the story. Clem's death isn't for nothing because the cause of his death is the way that Jack cruelly hoists the 456 with their own petard; Johnson effectively rescues Jack from incarceration to fulfill this narrative purpose; Alice provides a son, a lamb to the slaughter. It's a fantastic opening out of the narrative and it's chilling in the way Jack uses these separate threads. Jack very much becomes the untempered 10.5 version of the Doctor, knowing that he has to kill a child in order to save millions more and he doesn't flinch from the operation even though that child is his own flesh and blood. It's Biblical in scope. Jack, as I discussed earlier, is not a very pleasant person to be around and it is truly shocking to see him go to these extremes. He has to become as monstrous as the 456 and Prime Minister Brian Green, be as ruthless as they are to accomplish the goal of eradicating the threat and saving those children. It's as gut-wrenching as Bernard Quatermass and his daughter setting off the nuke to banish the alien threat in the 1979 Euston Films series. There are great parallels here between both series about human sacrifice as well as the raison d'etre of the alien incursion. In Quatermass, humanity is being harvested as a condiment to a greater meal, here the 456 are simply drug addicts who want to get a good deal on the merchandise and get high on kids. That there was still yet another, darker twist to the 456's purpose in the story added to the complex political metaphors. Here, it's about the demands of the free market. At the centre of this bleakest of codas is that utterly chilling scene in which Frobisher, ordered by Green to publicly offer his own children up to the 456 as a sop to a government demanding a positive spin on their policy of 'the first born must die'. In that perfectly realised confrontation between Frobisher and Green, where Green can barely raise his eyes from the paperwork on his desk and look Frobisher in the eye whilst telling him to bury bad news, it's Capaldi's performance that succinctly signals to the audience just how dark this is going to get. I can't praise Capaldi high enough and his performance in this epic saga is probably one of the elements that has propelled Torchwood from what could arguably considered cult status to a full blooded serious drama that can hold its own in a prime position in BBC1's schedule. When he kills his own family, the sequence is brilliantly cut together with the scene of Bridget talking to Lois in her cell about him being 'a good man' who 'worked hard' which again touches on the themes of class, the social pecking order and how that refers to Johnson's observations about the desire to remove certain kinds of kids from our street corners whilst the 90% who are 'good' and 'work hard' are spared. The sequences where the troops arrive to take children away are painfully reminiscent of the ethnic cleansing activities reported from various unstable regimes from around the globe. Euros Lyn connects to this viscerally through rough and ready hand held camera work, adding a searing verisimilitude to the drama. Children Of Earth has clearly shown that Lyn has a blooming career in major films if he so chooses and his contribution to the series should not be underestimated. His visual judgement and his obvious attention to performances has paid off and if Torchwood did return then the notion of allowing a single director to hold the reigns wouldn't be a bad idea at all. Depressing as it was, the 'final solution' in which Jack kills his own grandson also offered us very decent performances from John Barrowman and Lucy Cohu, as Alice Carter. I was pleased that Alice's story was continued beyond her simply being held in a cell and that there was a conclusion of sorts to the Jack/Alice arc, even though Russell T Davies took it to perhaps one of the darkest extremes he's ever taken his writing. It's also interesting to compare the actions of Jack and Frobisher - Frobisher executes his own family and technically one could argue he's a coward for not facing up to the 456 or even attempting to get his kids out of harm's way and Jack, shell-shocked from all the death and destruction he's instigated, buggers off six months later after a final goodbye to Gwen and Rhys. Technically, is he also a coward for not starting over? Jack's journey could be seen as similar to that of Homer's Odysseus - a hero that undergoes a series of tragedies and moral struggles in striving for a sense of place. Jack flees the cause of his pain for the home of imagination - in this case abandoning the Earth because he observes it as a sterile and futile waste land. Several times in the poem Homer describes Odysseus's quest as a desire for re-birth - a rising from the dead that can only occur when he reaches his home. Jack is now clearly looking for that home. Torchwood ends as it should. You can either accept it as a well realised conclusion to the entire Torchwood saga or you can see it as the end of this particular phase of the programme and, if a fourth series is given the go ahead, a new beginning, potentially with an entirely new cast. For now see this as a vindication of Davies faith in the series as a modern, adult drama and as the Torchwood we always hoped we would get three years ago. My goodness, that was so gut-wrenchingly bleak. Sure, the good guys won in the end (by a flimsy method - though that wasn't the important thing here) but at what cost? Generally, the population now no longer trusts the government, people's rights have been abused, etc. And individually, Jack sacrificed his own grandson, his relationship with his daughter, and more. Ianto, Frobisher, Clem and more died. And Torchwood is no more! I was expecting a happy, fully resolved ending. We didn't get that. We got something more... realistic (well, sort of given the nature of the show) and depressing. In a way, it was much, much better than I was expecting but it was hardly a pleasant experience. It was brave of RTD et al to end it this way - but I wonder how many "normal" viewers it alienated? One of the things that Torchwood has needed is a reminder that it is not Doctor Who. The ending to Children of Earth underlines that; none of the events we witnessed could have taken place in Doctor Who, because - as we are reminded so often - it is a Family Show. In the end, the people we looked to for heroism didn't give it, but we saw flashes of it from the usual RTD source: his Ordinary People. Johnny, and PC Andy, who were sucked into a situation so far beyond their own powers that they couldn't begin to understand - which they demonstrated - nevertheless acted heroically when everything went bad. They didn't do much, and their resistance was futile (isn't it always?) but at least they fought back. A trend has been growing in TV, really since writers worked out that you could tell one, ongoing storyline over weeks and months, even to years. We have seen RTD treat a season of Doctor Who as one story split into chapters, it's no stretch to see this as the end of Torchwood's first chapter (or the last), and perhaps the chapter end of Jack's current story. But this does not mean an end to the show, nor is the ending we were given really an ending; life, as they say, goes on. We have the promise of birth and renewal from Gwen, for example. This doesn't have to be over, but if the BBC decide that the show needs a rest, well, after that - who would argue? I don't think I could have said that any better, Dave. I can't quite understand why fans are arguing that the Doctor should have made an appearance or that the end should have been happier. This is Torchwood not Doctor Who and I'm sure one of the aims for this five parter was to demonstrate that more than ever before. If the BBC doesn't renew it then it went out in spectacular fashion and is certainly one of the best pieces of telefantasy that will be remembered for a very long time. You can't ask for more than that. This was truly the best weeks TV ever !! Every day I waited to see how they could better the day before, and I was never disappointed. RTD is a legend. It's still all going round in my mind days later. That's satisfying; drama that throws up lots more questions than answers. Reminds me of how I kept thinking about the concepts offered up in Terminator II all those years ago. Superbly written. Brave and intelligent and no "Happy Ending". The only irritant was the way Lois Habiba kind of fizzled out... "I'll see that she's released" wasn't enough. Even a scene suggesting how she might have coped in the aftermath of her experience as a temp at the MOD...what would her skillset read on her CV now? Picture Lois at the Victoria branch of Office Angels or Reed Employment. Agreed that it doesn't have to be like Doctor Who but I think some people (like my wife) were expecting a happier ending. Not happy as such, just some ray of bright light in the bleakness. I thought, from an emotionly uninvolved standpoint, that it was quite refreshing. Yes, the show was very good but there were a few things off for me. And a few unanswered questions (not including the whole "What the hell were the 456"). Like... what happened to all the other Torchwood teams? Were they doing anything? Why didn't they, or UNIT, or some other boffins try something against the 456 (like blocking the 456 frequency or something)? Why did it take until the very end for someone to do something? The frequency 456, is that like a digital channel number, 456 MHz, 456 kHz, or something else? How did the 456 close the doors and introduce the virus into Thames house? How did Mr Dekker (I think that was his name) survive that attack - he put on the NBC suit a little late? Why was Dekker acting so weirdly at times? And many more. Wouldn't it have been better if Clem had survived the "severing" long enough so he could CHOOSE to be the instrument of the demise of the 456, instead of Jack's innocent, scared and confused grandchild whose trust in his "Uncle Jack" was betrayed?